Is the apartment/condo for rent in Angeles City still available? I stay with you folks when i come every year. I’m taking a year off and want to know how much for the year for a superdelux room if there is one available in Feb when i come. I plan to pay in cash for the year. If not, do you have any recommendations? Can we avail 3 luxury apartelle rooms? I would like to know is your fan room is good for 3 adults ? if yes, can I know the rate ? and also do you provide the transport from Clark Airport ? Do you have a room for 2 people for 1 or 2 nights? What is the price? We will arrive into Clark airport at 11pm. Do you have airport pickup? If so how much? Otherwise what will a taxi cost from the airport to the hotel? I am going to retire soon and move to Angeles City. If I am a vfw, RSL member and if I want to live there full time,and I am going to pay in cash for a month? what is the best rate i can get for a Super Deluxe room? or for a deluxe room? Thank you so much for any help you can give me! I am planning trip for three weeks with the family. what kind of deal do you have for two rooms, one with a kitchenett and the other one with out? Do you also provide airport pick up from manila? the time frame would be july 30th to aug 20th. Thanks for any info you can provide, can you please send a response, again thanks! I would like to say thanks for the quick and courteous reply to my questions, I have some more questions! The fan room, is it equip’d with air conditioning? We are planning a three week stay like I have mentioned earlier, but not all of our time will be spent in the Angeles city, will we be required to pay for the nights that we are out of town? And do you have Skype? It makes it much cheaper to contact then calling on the phone, and I like talking face to face with everybody. Thank you for the patience in reading and answering my questions. also as alternate email contact can you please send a response, again thanks! I just want to make sure that you have “4” airconditioned rooms for us. Will you be needing a credit card deposit? Please let me know. I don’t want any misunderstanding about the room reservations as I am bringing “3” new friends to danielas place. We have 4 air conditioned rooms reserved for you and your friends. No need to do any deposit. Pay when you get here. Hi Dan , do you have a standard aircon room, check in 10th March for 7 nights. arrival is Cebu Pacific from Singapore at 8pm on 10th. Pls accept this as a confirmed booking. Is it possible to arrange airport pickup for the tomorrow at 7:05 PM(arriving from Kalibo) and if so, what is the price? im sorry we dont do airport pick up. Do you have a room good for 8 adult or a suggestion from you to accommodate us. An aircon room for 10 nights. All our rooms good for 2 persons – each rooms. Prices shows on our rooms and rates or on promo rates page. On rooms and rates page or the promo room page, each rooms has descriptions includes prices, how many persons can be in the room and other amenities u may avail. for 8 adults, u have to get 4 aircon rooms or 4 fan rooms. Thanks. Kann man mich dort abholen ?? Wenn ja was kostet es ?? We have rooms available. Prices and rates can be seen on our page. Gibt es auch ein Abholservice vom Flughafen MAnila ?? there is also a pick-up service from the airport manila? Sorry we dont do Manila airport pick up but I can give u a number to call for taxi. He’s June Pineda from rent a car here in Angeles City 0912 416 6661. He got cheapest price in town. Yes we have a wheelchair friendly room available. Sorry No children allowed in our establishment. Do you have like a family room?? Family room that’s good for 4 to 5 persons?? Hi. Would just like to ask if you are still up for a reservation on Feb13-15? For a standard aircon room. And how much? Thanks! Its 800 per night for standard air for this months promo. For 2 nights its p1,600. All rooms good for 2 persons only. No children and pets allowed. Would you like me to reserve u a room? 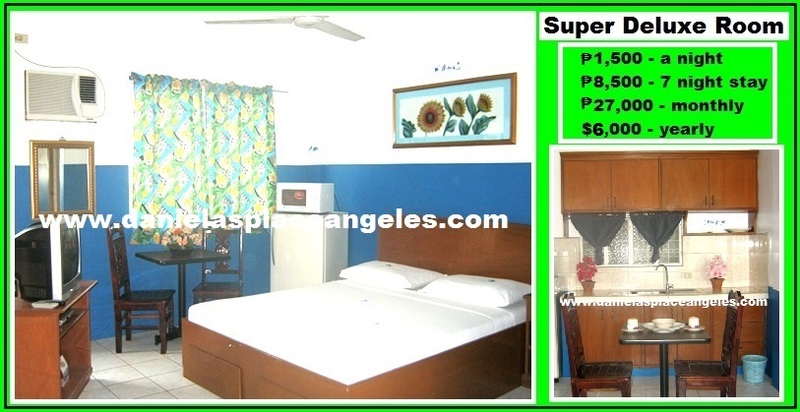 Aircon room is P850 per night good for 2 persons only, we have no extra bed. We dont allow children and pets. Would u like me to reserve u a room? Im looking at staying one month in super deluxe room in august 2015 do you have a room available? Is this place pet friendly? I have a small shi tzu. No Pets Allowed, No Children Allowed. I am planning to put reservation for oct 5-oct 9 for one adult. I hope you still have any available for airconditioned room, with fridge and microwave in it. How much could be cost and what’s the procedure for reservation? I’ll be waiting for your response, have a good day. Yes we have rooms available, p850 a night x 4 nights is p3400. Book me a room, I’ll see you on Monday. I want to reserve 1 Standard Aircon Room for jz 1 night on Nov. 25, 2015. Hi Helen, your reservation is confirmed. What time would u be arriving on the 25th? hi good afternoon would like to ask if you still have rooms available date feb 14-29? based on monthly promo. and is super deluxe covered in your promo? would love to hear from you soon. Hi, we have different promo every month. We have rooms available. But we don’t accept reservations from Feb 11 up to Feb 15th. Walk ins will do on those dates if we still have rooms left from Hot Air Balloon’s festival. How much is your monthly rate? planning to be there on March 7 to april 6. Looking to book a room from 14 Aug to 26 Aug. Please let me know if you have a standard Aircon room available during that time period. I sent you an email but stated it was wait listed and not delivered.